Exceptional Colima Mexico pottery figurine, 100 B.C. - 500 A.D.
Mexico, c. 100 B.C. 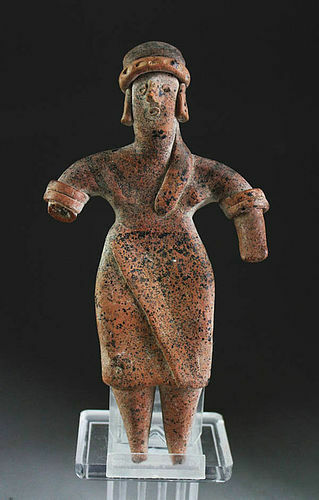 - 500 A.D., the standing female figure, wearing garment, bracelets and decorative headdress. The figure of very fine quality hard burnt terracotta with remnants of decoration. Condition: Choice! loss to right hand, othervise completely intact and very sound.